I enjoy reading National Geographic and other magazines which really cover their subjects in great detail with fascinating articles from all over the Earth coupled with outstanding photography. As I got more and more interested in photography. I found I wanted to know how the photographs were created. Over the last few years, many of these photographers have been sharing their knowledge and talent via blogs, books, websites and more and more often with eBooks. 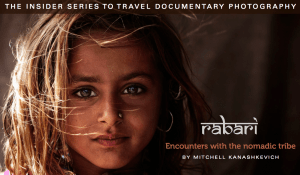 Mitchell Kanashkevich is an award winning travel and documentary photographer who is the author of a very unique eBook on Travel Photography called Rabari – Encounters With the Nomadic Tribe. I know, it does not sound like a title for a photography book. Think of it as going on assignment with Mitchell to India and having the opportunity to hear him tell you the how and why of the photographs he choose to take. In Rabari – Encounters With the Nomadic Tribe, Mitchell Kanashkevich presents ten photographs from his four months of living with the Rabari. With each photo, he goes through the same process in order of how he came about to photograph the subject, the challenges of doing the photography, how he solved those challenges and the post-processing of the photos to create the look and emotion of the moment as he saw it. Starting with the original image before processing it. For me, it was an engrossing way to learn how a travel photographer thinks and works out in the field. Mitchell did all this with a Canon Rebel, three prime lenses (including a Nifty-Fifty) and a collapsible 5-in-1 reflector. I know some of you will be happy to know he did not bring a flash and relied on available light, his assistant and the reflector. His explanation and uses of the reflector to sculpt the light will get your brain working on how you can do it, too. It sure did mine! The ten photographs chosen are all very interesting and tell a story about the Rabari people. 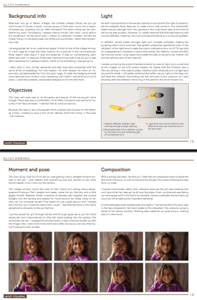 While the eBook may seem structured, each section for the photos is very different. He mentions several times how much help his guide, translator and photography assistant was in being able to understand the Rabari’s views on strangers, especially one who wanted to take their photographs. This is not unlike us going to a different part of our countries and encountering cultural differences. This is how I looked at it as I was reading about each of his encounters. Besides the goals of showing different aspects of Rabari life. There was the technical and practical aspects of how to achieve the light needed, what exposure to use, interacting with the subject to get natural behavior, editing the shoot and finalizing the photo in the digital darkroom. Mitchell uses Adobe Lightroom for most of his photo editing needs with some work in Photoshop. He explains his edits in broad terms since editing is a very personal thing. From his steps, you could go to your software and do similar changes and improvements. I do not do a lot of brushing in of adjustments but, after seeing his results, I am going to be doing more of it as a way of getting more visual control over parts of my photos. Rabari – Encounters With the Nomadic Tribe has 58 pages of content which reads quickly. Photos are large or can be enlarged in your eBook reader or software so they can be studied. I would go back to the finished photo after reading the post-processing part with a new appreciation. When I got to the sixth photo, I started to work in my head the kind of adjustments he might have used and how he controlled the light. The eBook costs $24.95US and is available for immediate download from the links in this article. This entry was posted in Photography, Travel and tagged documentary, ebook, india, mitchell kanashkevich, rabari, reflector, review. Bookmark the permalink. The creative process fascinates me, whether the creator is a painter, a photographer, a dancer, an engineer . . . . I always learn something from listening, or watching, or examining the finished work. Very absorbing. This eBook was like that. It was like I was with him as he made his decisions on who, what, where, how and why through each step of the process. The images are stunning. Thanks Scott for the eBook review. I think I could learn a lot from his technique since I don’t like to use flash also, but carrying a reflector around might be kind of awkward for me. I saw a few videos on how the photographers edit his/her work by using brush, something that I never tried and was amazed of the result. Mitchell has another ebook where he uses flash to add light in circumstances where ambient or artificial light is not enough.